Have you met our unit’s pals, Mr. and Mrs. Chicken? Chicken Games are Awesome! Thank you Becky’s Guiding Resource. Chickens can often substitute for other equipment… They replace balls, flags, boundaries (“don’t go past the chicken!”) and beanbags in many games. Our girls played Capture the Chicken at camp. Guider Nicole suggests Ultimate Chicken (instead of Ultimate Frisbee). Chickens save time… They don’t roll like balls do and if someone misses a throw, it won’t take forever to get the ball back. Chickens don’t hurt if they accidentally bop you in the nose… They’re soft and less likely to cause injuries. Chickens store easily … They can squish in around other stuff when you’re packing up. Chickens are easy to get and not too expensive… Look in the dog toy section at Walmart ($8) or the dollar store ($2). I suggest, for your sanity, that you perform an immediate noise maker-ectomy with some needle nose pliers. Chickens give you an instant filler activity if you have a gap in programming. Everyone wants to play a chicken game. Chickens can help develop leadership skills … Ask the girls to make up and lead their own chicken games. 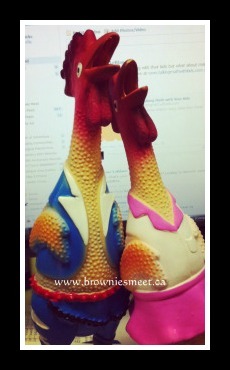 Chickens cheer you up… At camp, an unhappy Brownie may find comfort with a hug from a chicken (it works!). Originally posted to Cara’s own blog Brownie Meeting Ideas, February 6, 2014. By guest blogger Cara Hicks, Brown Owl for the 119th Ottawa Brownies.